The Provocative and Practical Guide to Coaching Agile Teams As an agile coach, you can help project teams become outstanding at agile, creating products that make them proud and helping organizations reap the powerful benefits of teams that deliver both innovation and excellence. More and more frequently, ScrumMasters and project managers are being asked to coach agile teams. But it's a challenging role. It requires new skills--as well as a subtle understanding of when to step in and when to step back. Migrating from "command and control" to agile coaching requires a whole new mind-set. 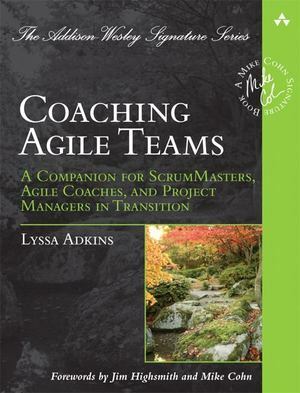 In Coaching Agile Teams, Lyssa Adkins gives agile coaches the insights they need to adopt this new mind-set and to guide teams to extraordinary performance in a re-energized work environment. You'll gain a deep view into the role of the agile coach, discover what works and what doesn't, and learn how to adapt powerful skills from many allied disciplines, including the fields of professional coaching and mentoring. Coverage includes Understanding what it takes to be a great agile coach Mastering all of the agile coach's roles: teacher, mentor, problem solver, conflict navigator, and performance coach Creating an environment where self-organized, high-performance teams can emerge Coaching teams past cooperation and into full collaboration Evolving your leadership style as your team grows and changes Staying actively engaged without dominating your team and stunting its growth Recognizing failure, recovery, and success modes in your coaching Getting the most out of your own personal agile coaching journey Whether you're an agile coach, leader, trainer, mentor, facilitator, ScrumMaster, project manager, product owner, or team member, this book will help you become skilled at helping others become truly great. What could possibly be more rewarding?